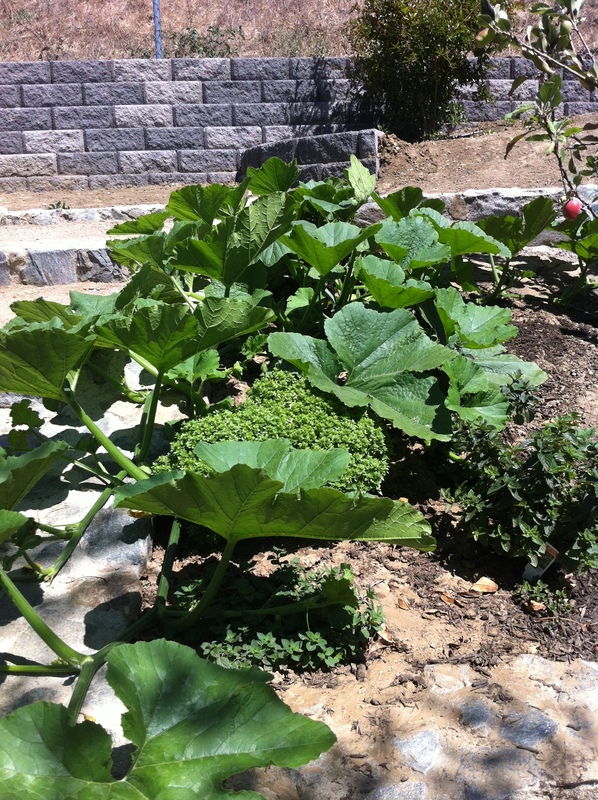 After our summer vegetable garden burnt up, I am afraid to plant my winter veggies. But I did a few weekends ago. Mostly radishes are up and some peas. The lettuce and carrots aren’t up and they should be. I am not sure what I did to the soil — maybe the urea and straw I put two years ago? Or is it too sunny or do I need to water twice a day? 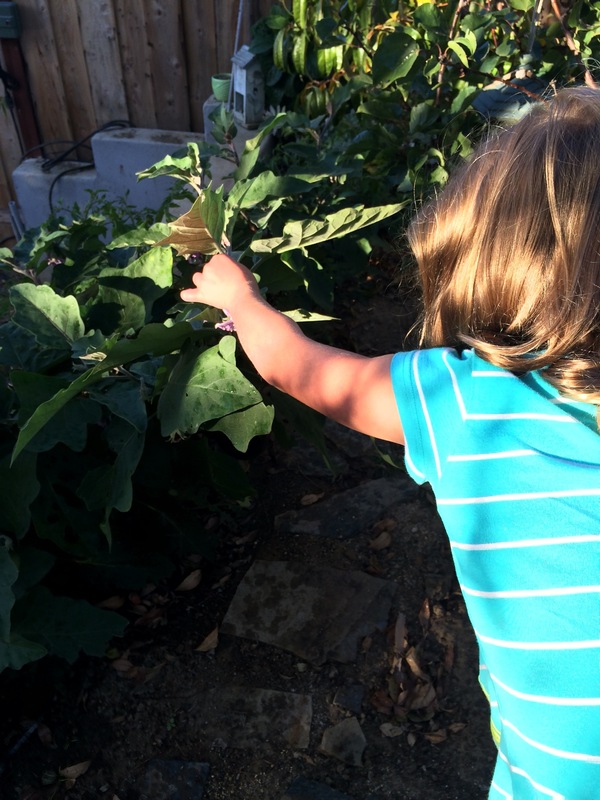 Anyway, my daughter’s eggplant is still huge and we are still harvesting eggplants. 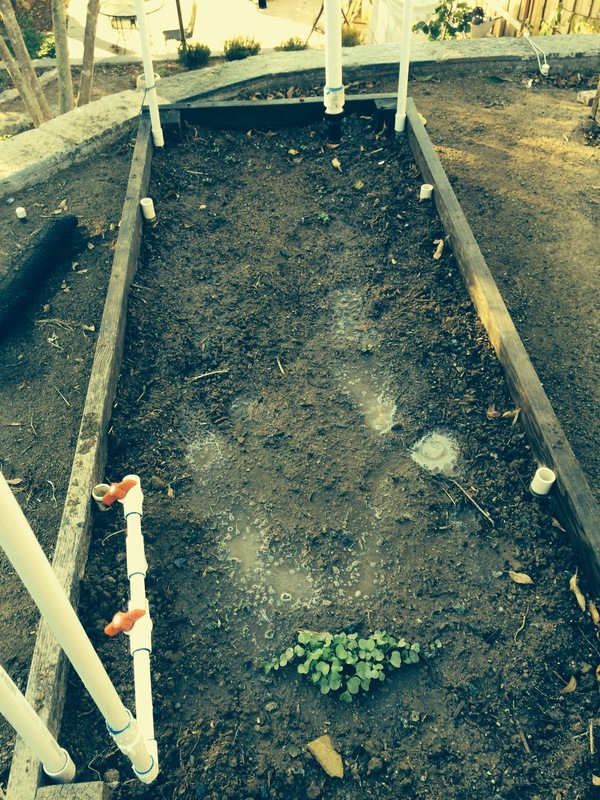 She planted carrots and lettuce under it and they were up within days. My carrots did not come up! Any ideas on what’s going on here? I need help! 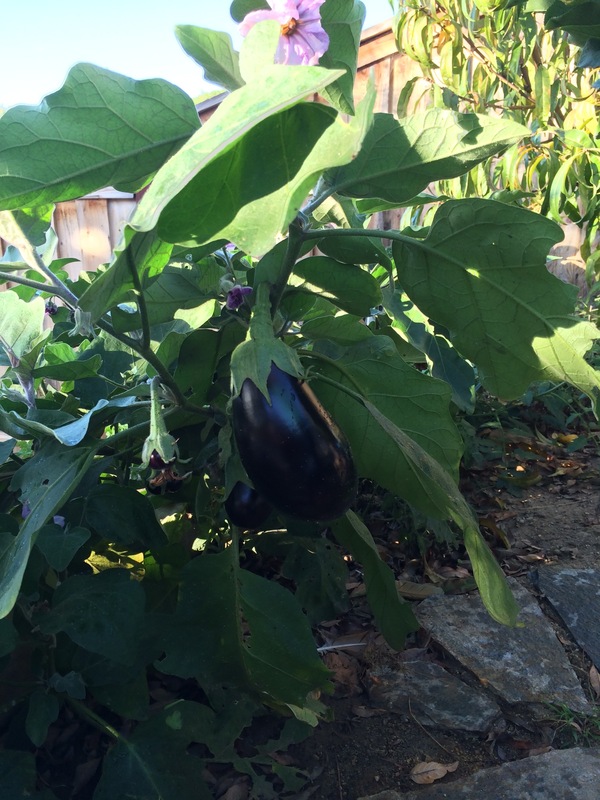 We had one good eggplant in our summer garden this year. I just ate it last week! Breaded it and fried it up! 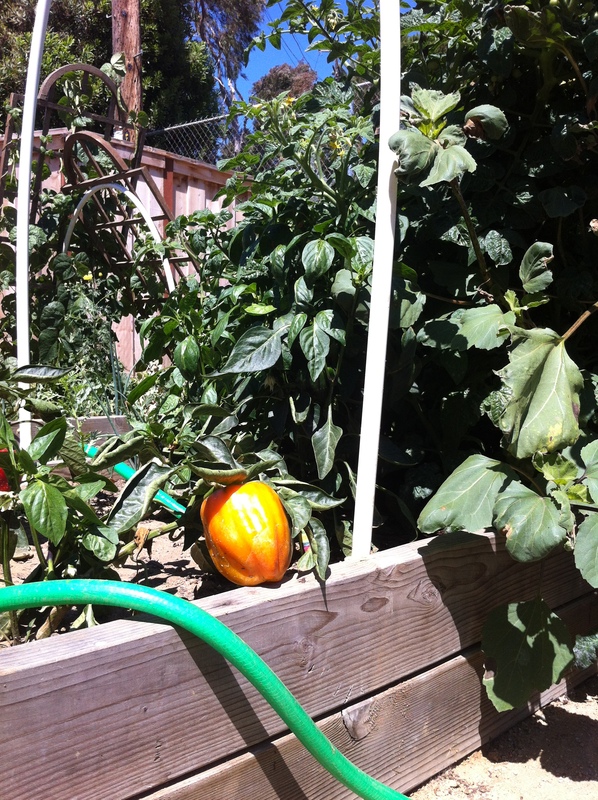 We had lots of tomatoes too but the eggplant only started to grow at the end of August and then it took off. I hope we get some more eggplants from it. There are more blooms. It was so hot this summer that everything in our regular vegetable garden died. 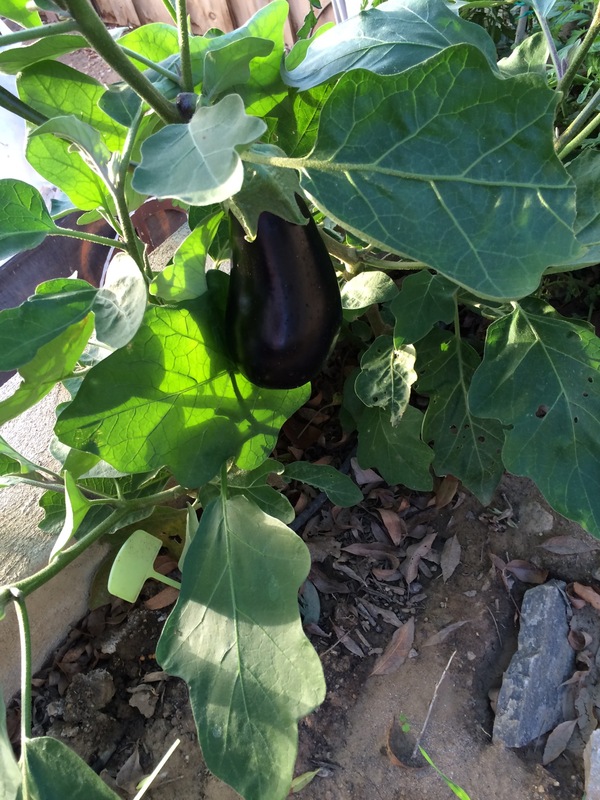 This eggplant grew in my daughter’s fairy garden and was shaded by a peach tree. Remember too much squash? Well, too much tomato is happening now in my house. My friend up in Huntington Beach grew these amazing tomato trees. She had way too many tomatoes. Her recommendation is to dehydrate them and turn them into sundried tomatoes that you can freeze. You can do this in your oven. The solution I seletect: Gazpacho. Homemade gazpacho from fresh tomatoes is especially delicious. 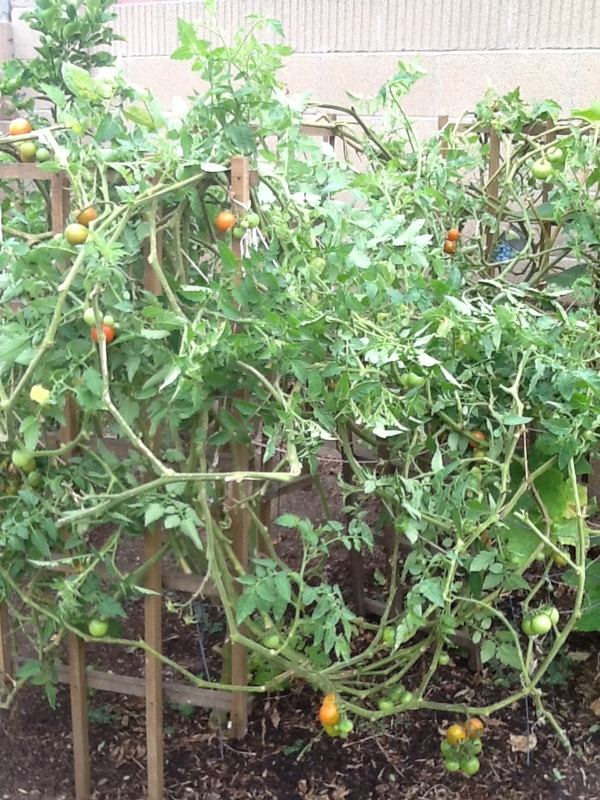 I was facing a situation where all my tomatoes ripened at once and were starting to go bad. I made yummy gazpacho and took it to a concert in the park. We drank it out of big red cups and added toppings of croutons and avocados. Delicious! 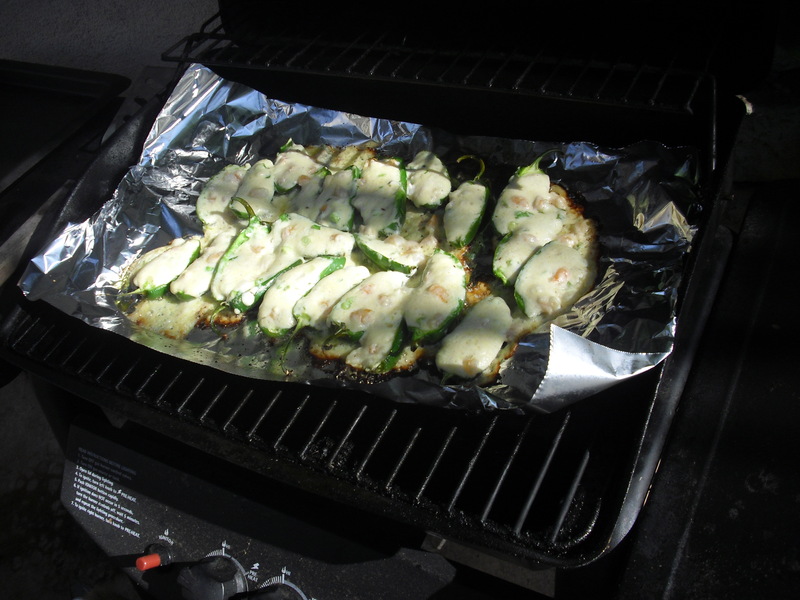 Here is the link to the recipe I used. It is very simple to make but you do need a blender. Another favorite dish to make is ratatouille. The Silver Palate cookbook has my favorite recipe. Thanks to my friend Marina who gave me these photos. Look at these crazy tomato trees! 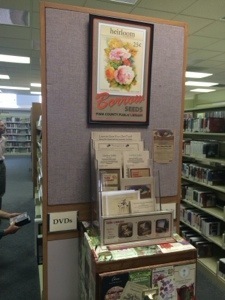 you can’t tell from this photo, but they were about six feet high. Happy 2014! Here are a few items to kick off the New Year in the garden. 1) Now is the time to harvest your lettuce. Last week, I needed healthy groceries and I was planning to go shopping at lunch to buy produce for a salad. 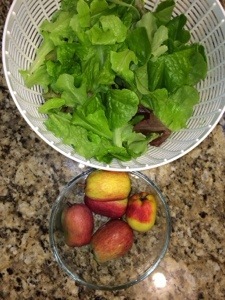 I went outside to throw something in the compost pile, and I saw lettuce and apples right there in my backyard! Duh. Just what I was planning to shop for. 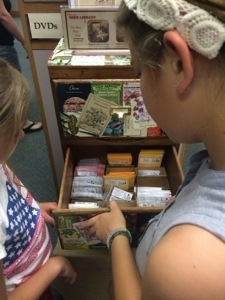 Don’t forget to harvest what you sowed! Delicious. 2) Broccoli. Why is broccoli so hard to get right? It attracts pests and the best way I have found to eliminate them is — water! 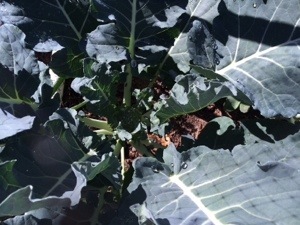 Shoot a stream of water at the aphids or yuckies on there every morning, and your broccoli should be fine. There is a floret in this photo, if you can see it right there in the middle of the plant. 3) New beginnings. My plumbing disaster is over. Now I am left with this in my front yard. 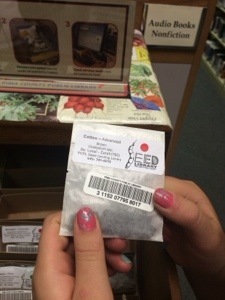 I have to plan out what I will plant. It is a chance to revise. When starting a new garden, think about colors you wish to incorporate. My garden is blue and gray so I will stick to that, but if you are starting totally fresh, you can think of the palette you find most soothing or interesting. I love coral and orange mixed with blue, too. That is my backyard. Another thing to consider–is your style formal or traditional, cottage or contemporary? You may wish to match your house style to keep the look consistent and provide you with guidelines. It takes the guess-work out if you match your house. My style is cottage (low water is also a priority.) 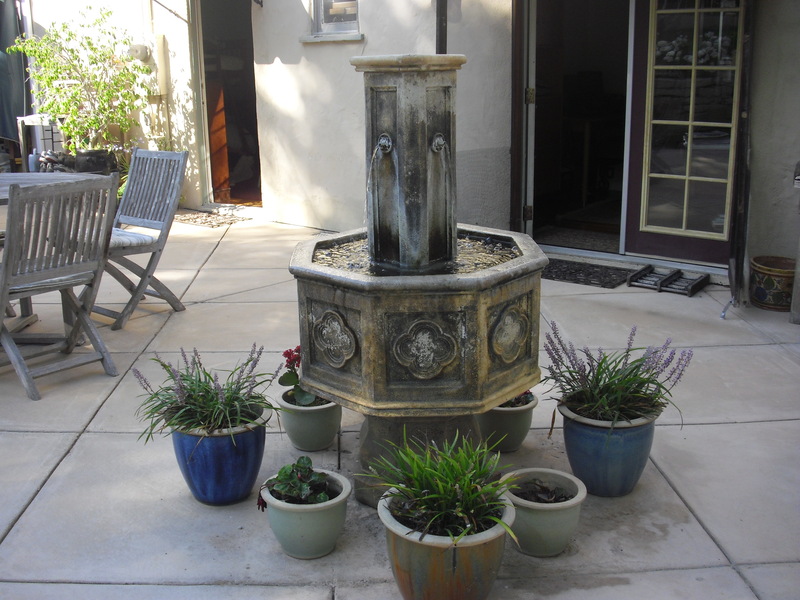 You can have a low water garden without turning to cactus or without staying purely contemporary. Cottage can work for drought tolerant gardening too. And boy, we better get going on that. What a drought we are in! 76 degrees today, too. 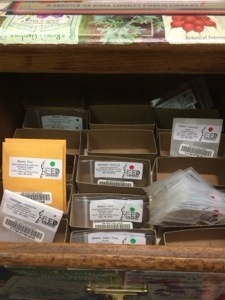 More thoughts on planting later as I get going. I know for one thing, instead of lambs ear, which always gets funky, I am going to use artichokes to provide the soft grey contrast colors my garden plan contains. 4) What has Cleo eaten lately? Well, she behaved over the holidays. There was always commotion and entertainment for her. 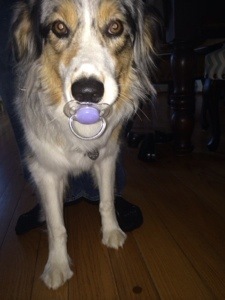 Aside from carrying a few socks around, she did not destroy much. The first day the kids went back to school, I was sorting through boxes of Christmas decor that I needed to put away, when I got a phone call from my neighbor. “Something is eating your chickens,” she said. I ran out there and sure enough, even though the gate was shut, Cleo had dug her way in and pinned one of our hens to the ground. I started screaming, wailing, really. I couldn’t imagine this happening, and I kept thinking of my friend, who told me her greyhound had sliced her chicken’s chest open. I chased Cleo off and poor Doodle just sat there in a well she had dug into the ground, her wings outspread as if she were dead. Her head was still up and alert, but she had a limp, flat body. I couldn’t face her, so instead, I scooped up Henny who was climbing the fence for the same neighbor who had called about the commotion. Henny was calmer than I thought and seemed to like me holding her. I shut her in the cage. Then I went back to poor Doodle. I was afraid to touch her. I softly prodded her, investigating her feathers for blood. There wasn’t any, so I scooped under her and examined her chest. No cuts. She had simply played dead. I now think that despite how bad it looked, Cleo could have done much worse. I think she was playing, smelling, burying her nose in Doodle’s feathers. I’m sure she chased Henny and Doodle, and caught Doodle who, poor thing, found a best defense in pretend death. We were so lucky. Cleo had lost her chicken manners over vacation. Now we are rebuilding them back–doggy boot camp. Other than the travesty of our coffee maker breaking, the week has been off to a pretty good start. Warning—this blog was written entirely without coffee. Even though it was not a perfectly sunny weekend, it was warm enough to garden, and I got a lot done. I planted almost all the plants I bought last fall and I only have one rose left from last spring’s order that I still need to plant. I’m scoping out a new spot–that means I’ll have to get another rose to plant where I thought I would plant this one. You can never enough roses! It’s good not to have planting last spring’s plant purchases hanging over my head. 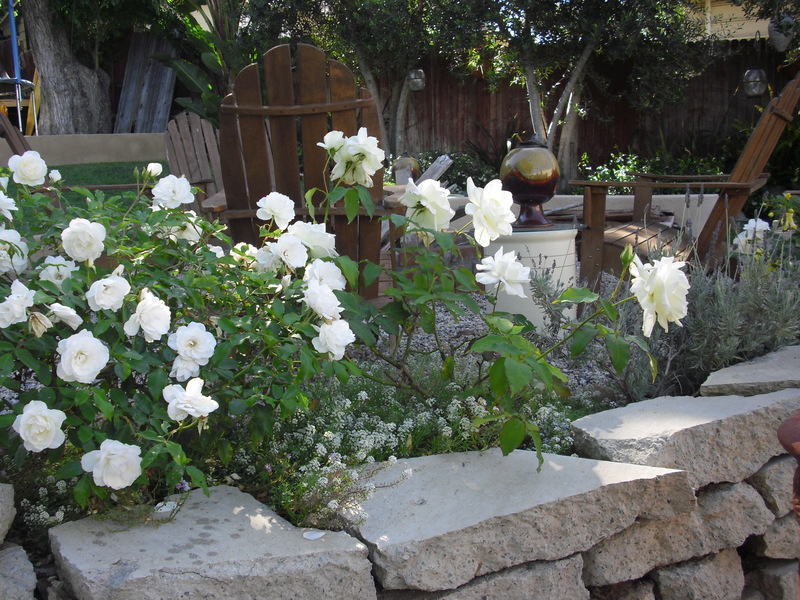 For some reason, I finally worked up the nerve to start using the Rose Pro method of fertilizing, what appears to be a complicated series of odd things you have to hunt down at nurseries and drug stores to pour on your roses each month—urea, potash and Milogranite—just a few of the things in my future. This week, I put Epson Salts and Super Phosphate on half of them today (the half that didn’t get the Ada Perry’s Magic Formula—I just love that name and won’t stop using it!). Now I have an experiment going. We will see what works better. I can’t put the Ada Perry’s with Bone Meal on my roses where the dogs will eat it so it goes on the plants outside the wall. The puppy took a lick of the Epson Salts but I stopped her right away and most of my roses are fenced off (for this reason and the because of the chickens) with that low green wire fence. I planted rosemary and horsetail reeds in my chicken garden. I need to buy more to fill out the space because they look nice and the chickens aren’t eating them. Rosemary chicken is a new joke around here. Boy, I’m so random. That’s a problem with liking plants and not having enough coffee. 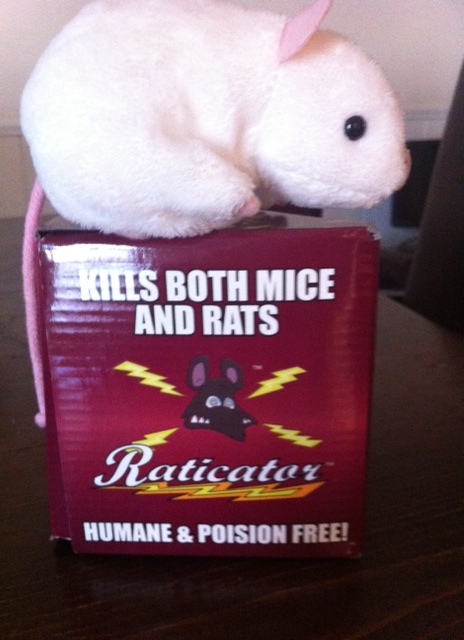 My husband bought a Raticator. You should hear Henrietta squawk when she sees a rat. It sounds she is being strangled. I heard chickens can stop laying eggs when the rats come so it should make Henrietta happy to have a new rat trap to save her. More Bill Wallis geraniums—they are looking great. Okay that’s enough! It will probably take me a year to plant all that. If I had a decent cup of coffee, I would probably make more sense. 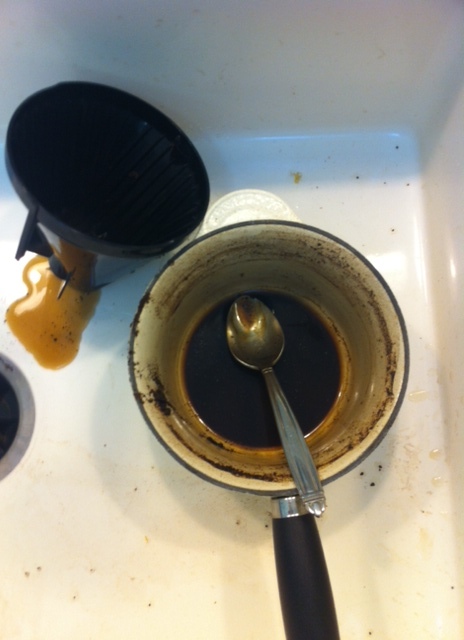 The French press is our salvation and our curse–it’s a slow process for a small cup of coffee. 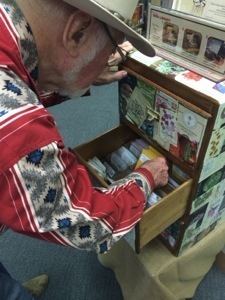 Today I heard my husband talking to my father about how to make cowboy coffee or boiled coffee, his lifetime specialty. We have to do something while we wait for our new coffee maker to come in the mail. Here is his try at cowboy coffee. Here lies my glorious pumpkin, taking up my whole herb garden. I celebrate its robustness–for the first time I actually planted and grew the plants on time and it is a magnificent vine, full of giant leaves, yellow flowers and tiny fruit. See the picture below–it looks almost mysterious in the morning light, shrouded in mist, flowing down my hill and sending its twining feelers out across the rock steps and over to the apple tree. But if you scroll down to the bottom of the picture below, you will see things are not as they seem. This is not the vital fecund fruit bearing plant it appears to be! No, the baby pumpkins are shriveling! Gasp! They turn brown and shrivel up and fall off. Not good. I have no words. Why do I go through this every year? 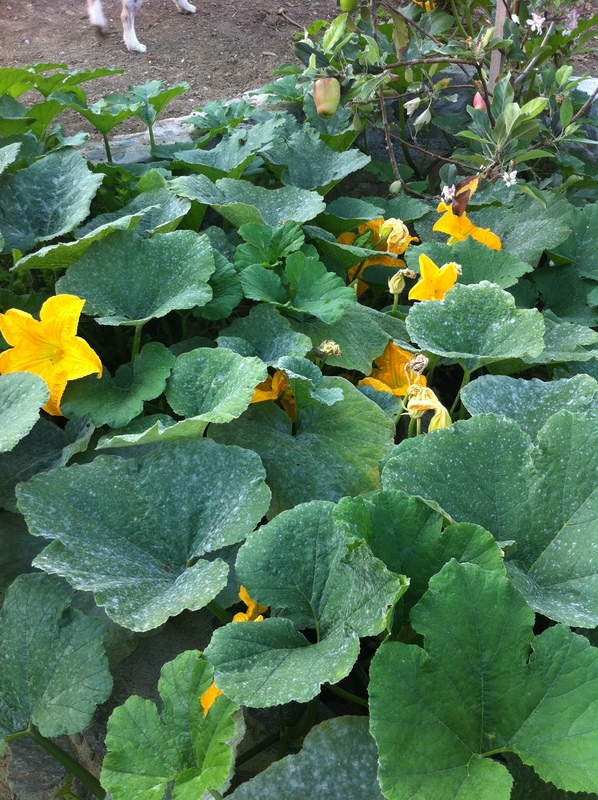 Why can’t I grow pumpkins? This morning after I took this picture, I decided to put on my bee hat and pollinate. I figured that out last year, but I thought that with this giant plant, I wouldn’t have to. But I did and there was one bee with me. Go little bee, do your stuff! (By the way, morning is good because the flowers are open). Now what? Really, what I want to know is–what’s wrong? Last year I got one or two pumpkins (from three plants). The year before I got one Cinderella pumpkin. Last year I fertilized them. Last year I planted late and I surely did not have a plant like this. 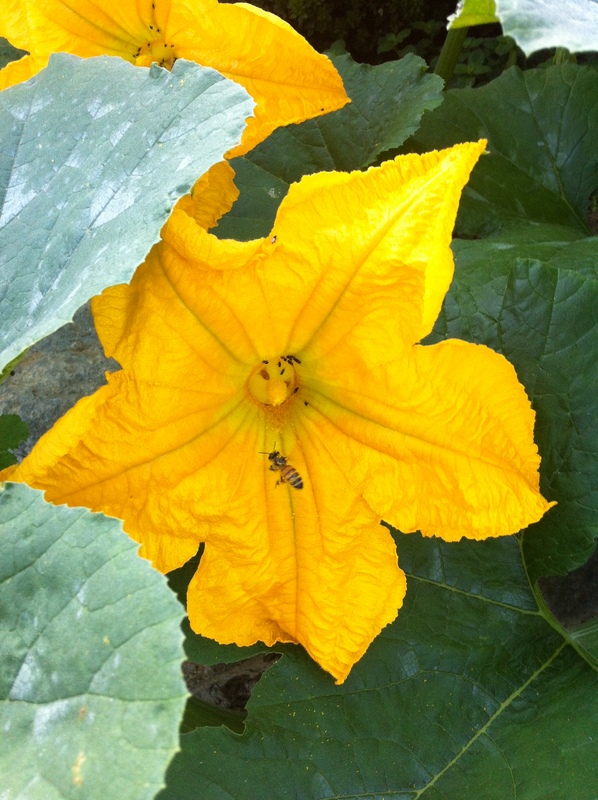 Oh yeah, I fertilized it with something called GROW BIG this morning after I did the pollinating. Geez. All this work for one pumpkin. Now I have to wait and see. It is very hot and humid now so maybe that will help, too. Honestly, I think the coastal air does something to them. I figured out it’s nearly impossible to grow Echinacea and Black Eyed Susans. That one year I grew Black Eyed Susans was a miracle. This year I bought the seeds from Burpee, I planted them in the ground, I planted a second control group in peat pots–guess what? One flower. ONE flower from all that. 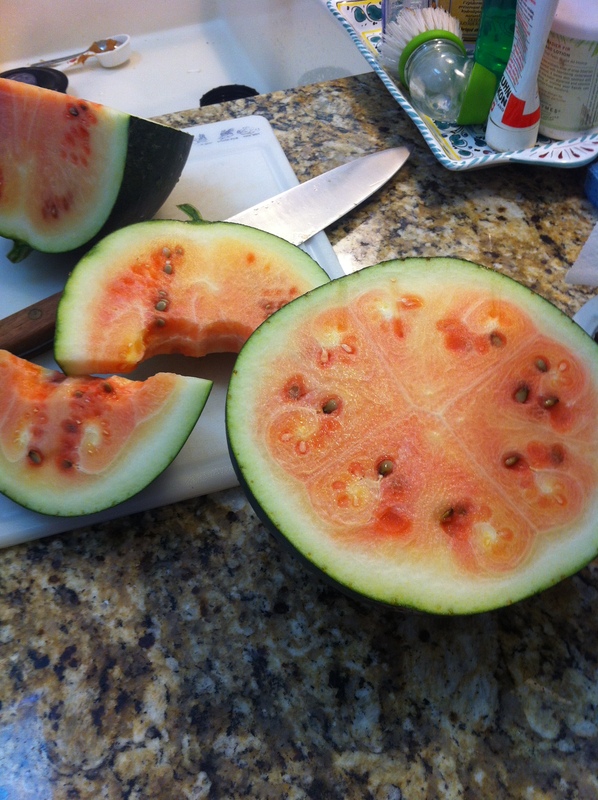 Hey, I also harvested this watermelon too early. Have you ever seen a kid who told her mom not to pick her watermelon look at you after you pick her watermelon when she told you it wasn’t ripe? You don’t want to see that face, belive me. It didn’t taste that bad. (But it didn’t taste quite right either so no one else would eat it but me pretending that I had done the right thing.) 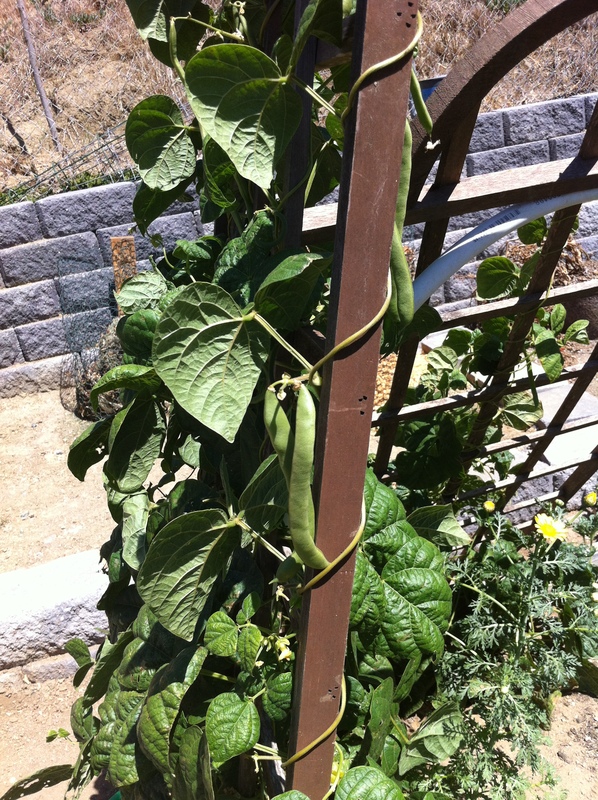 There are three more left safely on the vine, waiting ripeness. So, while my garden isn’t going exactly how I planned, I finished a draft of my 2nd novel this week. Yipee! This is Julie, matching her pillows. Our friends Julie and Brian have one of my favorite backyards. The space has a lower patio where they have dinner parties on a long Spanish table is surrounded by a retaining wall planted with lush roses, lavender, alyssum and sometimes tomatoes. The upper level has a sloping grass lawn–perfect for cartwheels, a fire pit area with chairs for lounging and borders of citrus and cannas. The upper level has another patio, a loggia type structure and the kids’ trampoline. 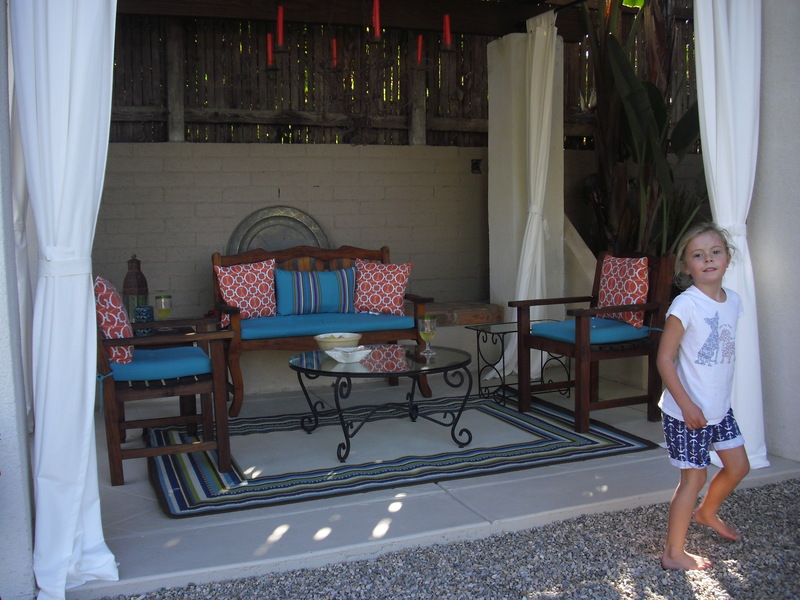 Julie decided to freshen up for summer and to redecorate her lounging area now that Brian put a tin roof on the arbors that make the outdoor room at the top of the hill. They had us over to see their hard work and have some snacks and of course, fabulous cocktails. Yum-yum. Get the recipe here: Sunset Magazine July 2012 edition. 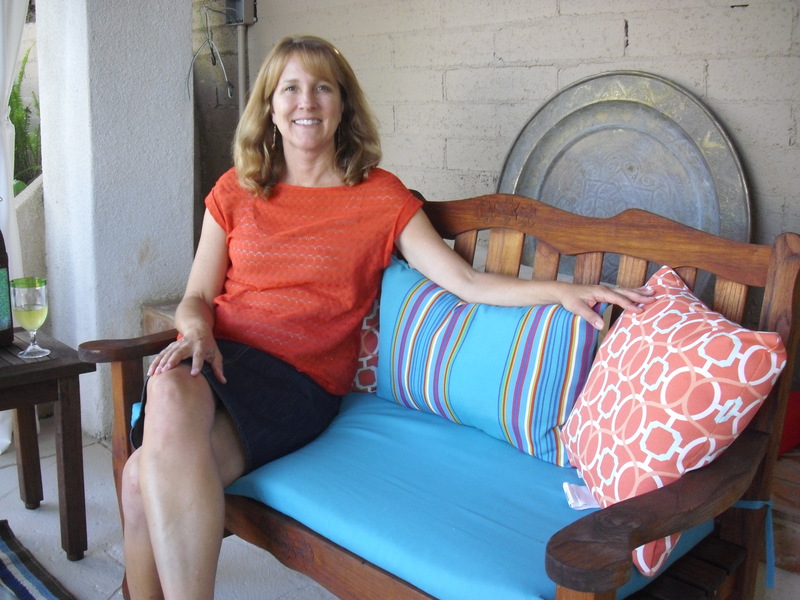 Julie is a designer, and I think the colors in her new garden room are fabulous. Don’t you? Orange and blue, my favorites. 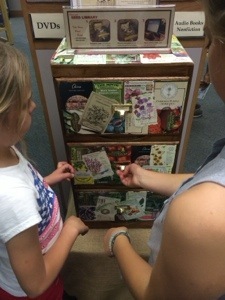 As we ate our jalapenos in her new room, seated on the newly rosewood oiled teak furniture, we planned the next few weeks of gardening. September is coming and that is a busy month in San Diego. I can’t wait for my family to be occupied with football on TV so I can go outside and garden–hee, hee. Really! Okay back to the yard– it looks amazing. 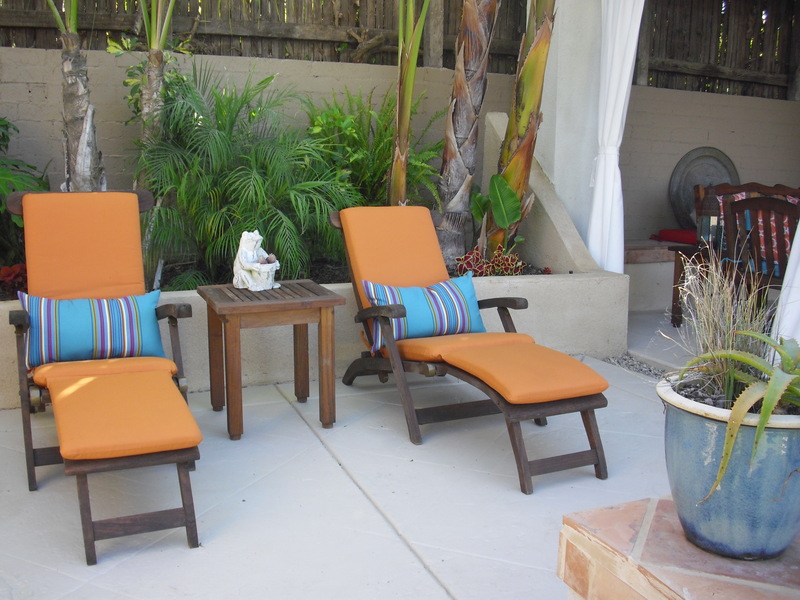 Here are more pictures of all the outdoor “living room” type areas they have interspersed in their yard–maybe it will give you ideas next time you want to create a garden room! Beautiful retaining walls from salvaged concrete patio. I love the roses and lavender planted along it. Some years, they mix in tomatoes. Those chairs surround the firepit. I like that they have lots of thick gravel to outline the different areas. Sorry, Brian! I don’t have your photo! You were too busy cooking! Today is a perfect July day. The sky is pure blue, the air is warm, but the breeze is cool. It’s a day to be thankful that I am in San Diego. There are flowers in my patio garden and vegetables in the back. 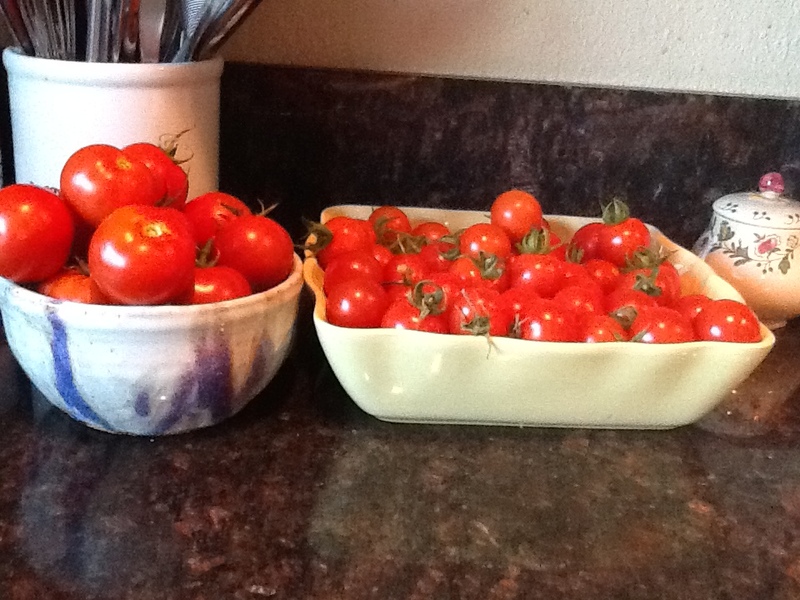 The tomatoes are ripe and the watermelons are getting round and full. We have more green beans and squash than we can eat and my daughter figured out how to play Ode to Joy on the piano. What could be more perfect! 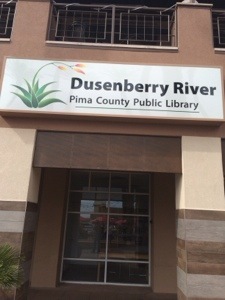 Maybe getting outside to do some gardening or just read a book. 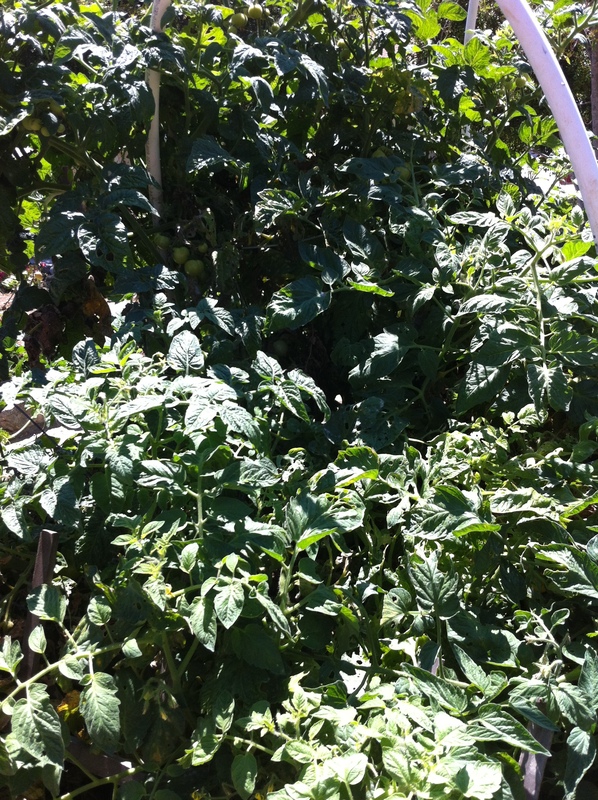 Three tomato plants growing together–Roma, cherry and a beefsteak. Pumpkin vines growing over mint. 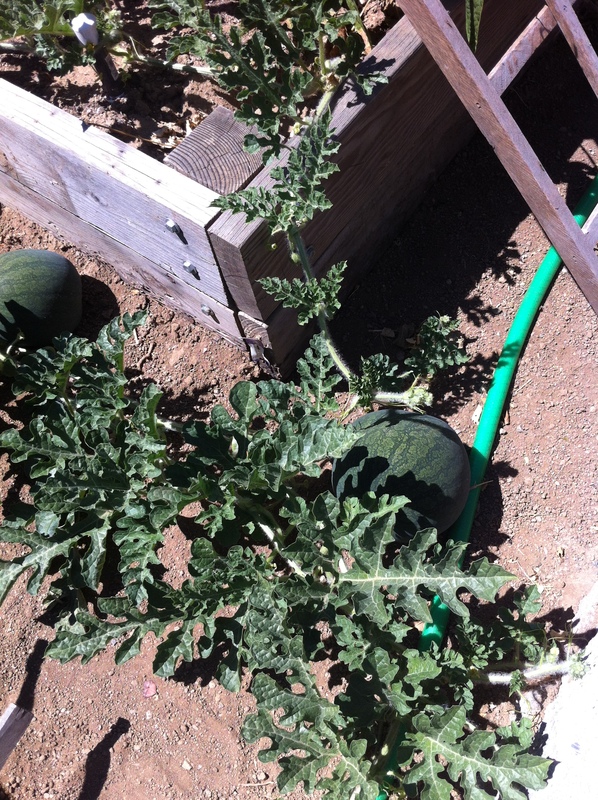 Watermelons-the vines are all over the place! 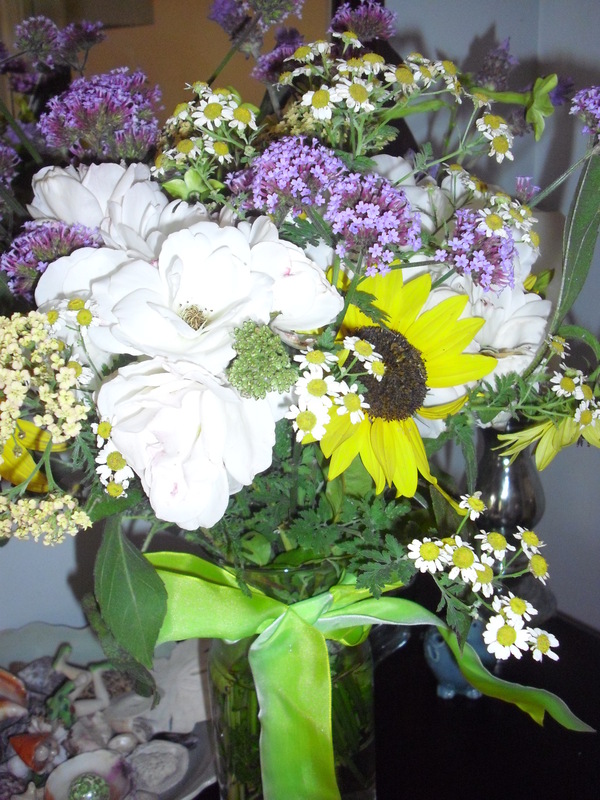 Summer bouquet picked from garden–yarrow, roses, sunflowers, feverfew, and verbena bonariensis, which is an incredible bloomer. 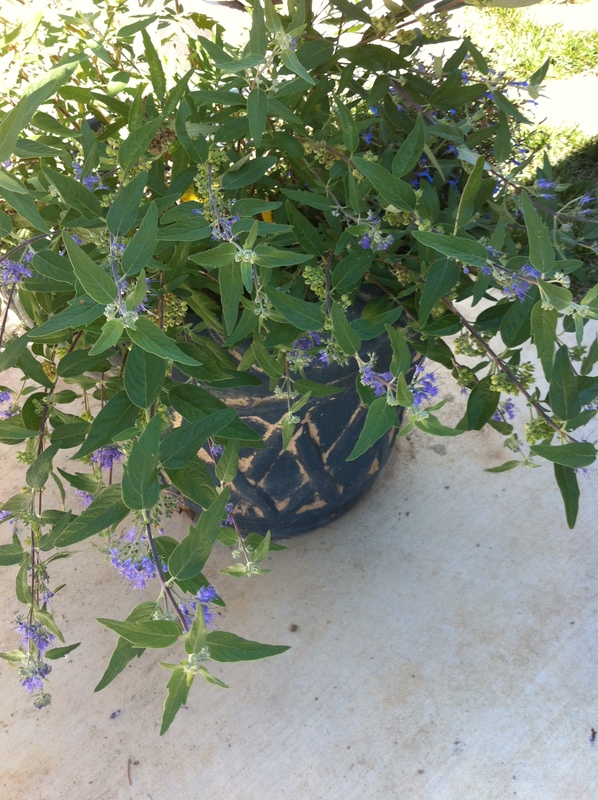 I don’t know what this blue flowering plant is, but I love it for a container garden. I bought it at Summer’s Past Farms. I need to go back there and buy some more (and figure out what it is). It looks like a mini vitex. 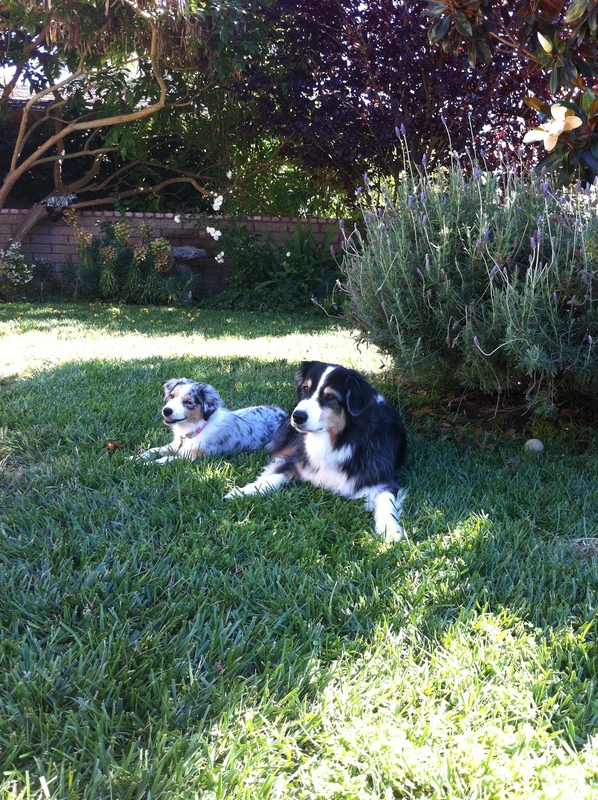 Dogs happy for the shade and cool grass. Vegetables grow best in raised beds. 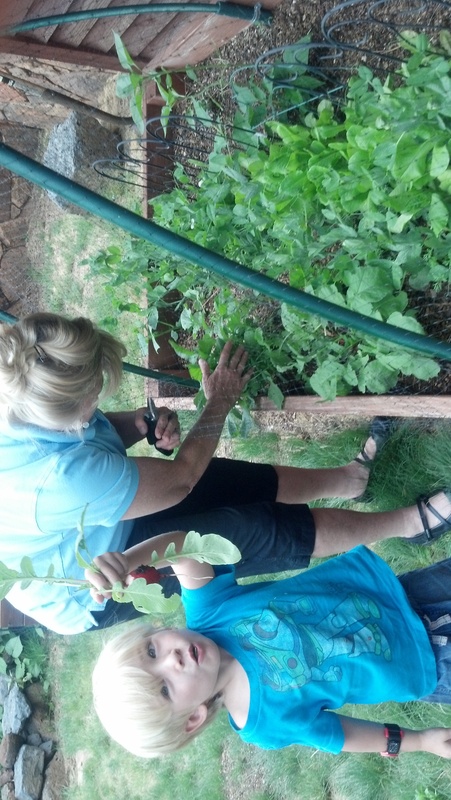 Many people have tried to garden in the high desert of Flagstaff, Arizona and failed. Although there are Ponderosa pine and wild grasses in abundance, and the climate is cool, the area is arid, the wind blows, and the soil is rocky. There are also numerous rodent species that eat all of the greenery in an unprotected garden. All of these factors must be taken into consideration to have a successful garden experience. 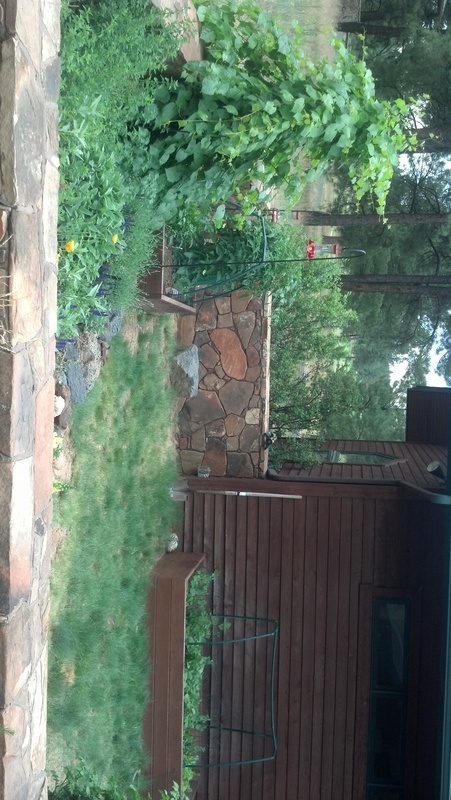 To start a vegetable and flower garden in Flagstaff, one must make raised, wooden flower beds about 6 feet by 3 feet x 2.5 feet. The beds must have tight wire mesh fencing on the bottom to keep burrowing animals from coming in and eating the plants, roots and leaves. The flower beds must be filled with enriched soil, that can be made prior to the garden season. Large bags of garden soil can be bought at any nursery, along with bags of potting soil. Mix together in a 2:1 ratio. Next add a bag of steer manure , or even better, about 40 pounds of good, seasoned horse manure. 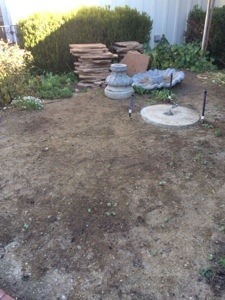 All of this should be well mixed and put in the planters, leaving about 3 inches from the top. Add some Miracle Grow Fertilizer on top of the soil in the raised beds, and the beds are ready to plant. A sprinkler system must be installed in each of the beds before planting. Spring planting in Flagstaff must be after the last frost. I try to plant by May 15, using plastic “Walls of Water” to trick the tomato plants into growing faster. These can be purchased at any nursery. The plastic sides are filled with water, and the tomato plants are planted in the soil inside of the walls of water. The plants don’t freeze using this technique. 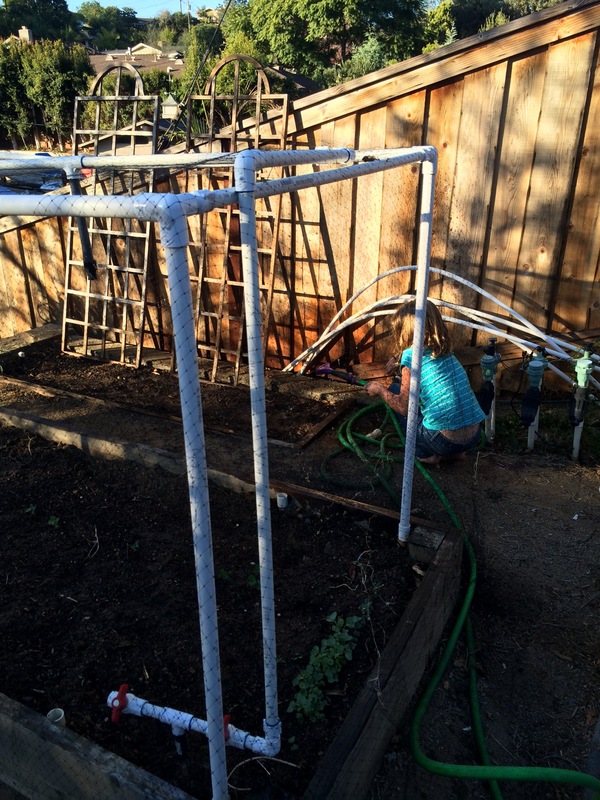 We also put PVC pipes in the garden beds, at each corner and in the middle of each side. 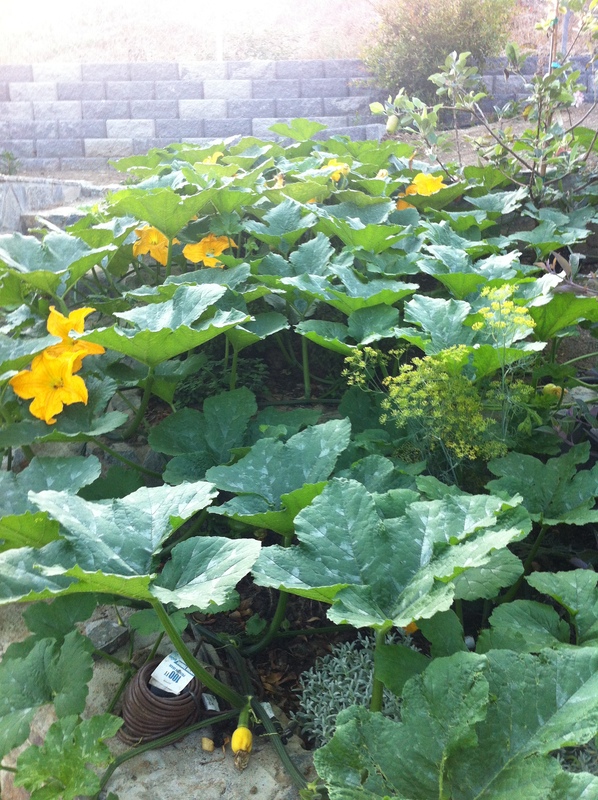 The height is about 3 feet from the top of the garden bed. We cover the garden bed and PVC pipes with black bird netting to keep the rodents from jumping in the garden and eating it. The netting hooks on to the side of the wooden planter all around to allow access to the beds. Occasionally, we find a squirrel stuck in the netting by his legs. Not a pleasant sight ! During the season, fertilize twice with miracle grow or fish oil. I have had some luck using Mole Mix sprinkled on the ground , to keep the rodents away. The crops will start to be ready by July 10, with 3x weekly soakings. Crops last until September 15, when there is a typical hard freeze. Potatoes and carrots can be left in the ground until the end of November, and then harvested.